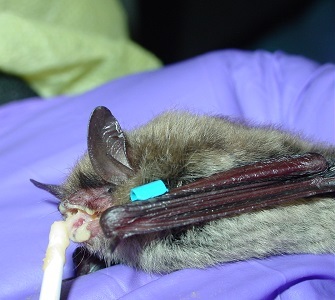 On Friday January 29, 2016 a biologist from the Vermont Fish and Wildlife Department (the same one who found Batman and Robin) was checking on the monitoring equipment at one of the hibernation caves when she found 5 endangered little brown bats hanging on the rocks outside the cave. Four of them were cold and hungry but were in surprisingly good condition. The fifth was in very bad condition. The biologist collected all five and they were transported to the Richmond Park and Ride where we picked them up and brought them to the Center. 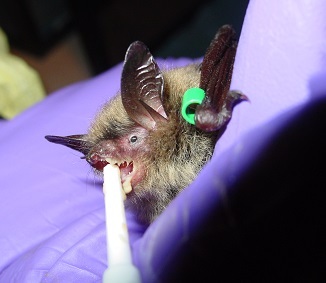 Because they came from a cave that is known to have the fungus that causes white nose syndrome (Pseudogymnoascus destructans or Pd) they were moved to the isolation area right away so the fungus could not spread to the other bats at the Center. 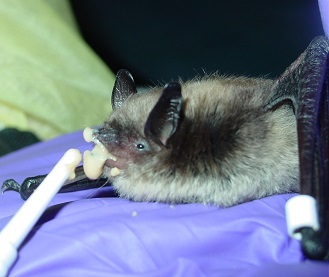 The bat that was in such bad condition did not survive but the other four are doing well. None of them liked it when they were examined! 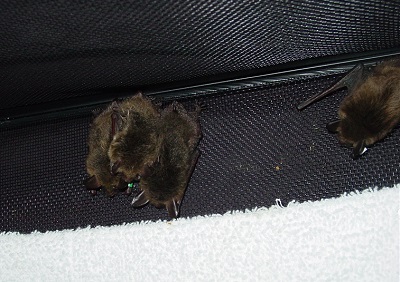 All four showed signs of wing damage from the fungus, just as Batman and Robin had. We have named these four bats Rocko, Crystalline (Crystal for short), Ruby and Gemma. They each have a colored band on their wing so we can tell them apart. They will be kept in their own cage in the isolation room for a while. If we get more bats that need to be in the isolation room we will move these four into the cage with Batman and Robin so the new arrivals can have the separate cage. News Flash: We have had an Escape! During the 10 PM feeding on third day with us Gemma escaped from the cage and is now hiding somewhere in the isolation room. She is so tiny (smaller than your thumb) that she can hide in the smallest space. We have looked everywhere for her but we have not located her. She has found a nice place to sleep and will come out one day when she is hungry.